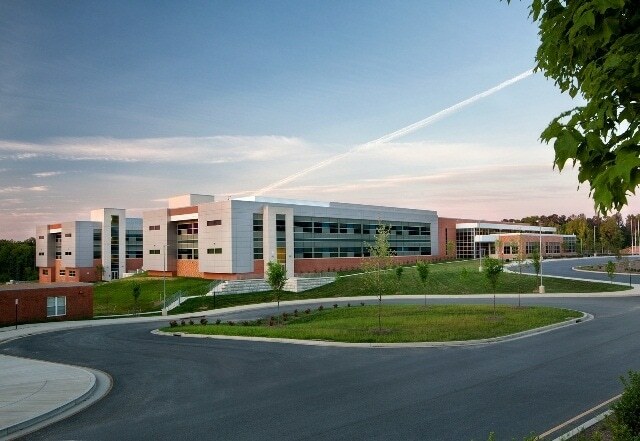 Huguenot High School in Richmond, VA earned Leadership in Energy and Environmental Design (LEED®) Gold certification with the Green Building Certification Institute (GBCI). Opened in 2015, the 250,000-square-foot building replaced the existing school, which had been in operation for almost 50 years. The new LEED Gold school is the first high school built in the city in 48 years. The new school is a flagship project in Building a Better Richmond capital improvement plan, and is the first high school built in the city in 48 years. As a STEM-focused school, Huguenot High School offers students modern technology, open learning spaces, two floors of classrooms, and a 2,400-square-foot vegetated roof for coursework. The school is also home to the Huguenot High School Community Center, which offers personal wellness and health services. Richmond Public Schools partnered with Moseley Architects to create the new school designed to accommodate 1,400 students. The city was eager to work with the team to minimize the facility's environmental impact while saving resources and operational costs. The result is a working and learning environment that inspires students and staff alike. Striving for efficiency, the team employed a number of strategies to save water and energy. The football field is a permeable synthetic turf to promote infiltration. Other fields feature irrigation systems that use moisture sensors and efficient valves and sprays. These efficiencies are expected to reduce irrigation water use by 625,000 gallons per year. Additionally, water efficient plumbing fixtures were used in the building, reducing water use by over 40 percent compared to standard fixtures and saving an additional 770,000 gallons of potable water per year. Additional strategies included the use of LED lighting, occupancy sensors, and high-performance glazing. The glazing strategy maximizes daylight. As a result, 90 percent of the regularly occupied spaces have direct views to the outside. In addition to using local and recycled materials, Hess Construction used low chemical-emitting materials such as paints, adhesives, carpet, and composite wood inside the building to protect indoor air quality. Stephen Halsey, Moseley Architects' project manager reflected on the response to the school. "I am pleased that the students have responded so positively to the building's features and that we were able to achieve the city's vision. Huguenot sets an example for what is possible for future school projects in the city."